Stunning custom farmhouse in Elk Creek Ranches on over 5 acres zoned for horses. 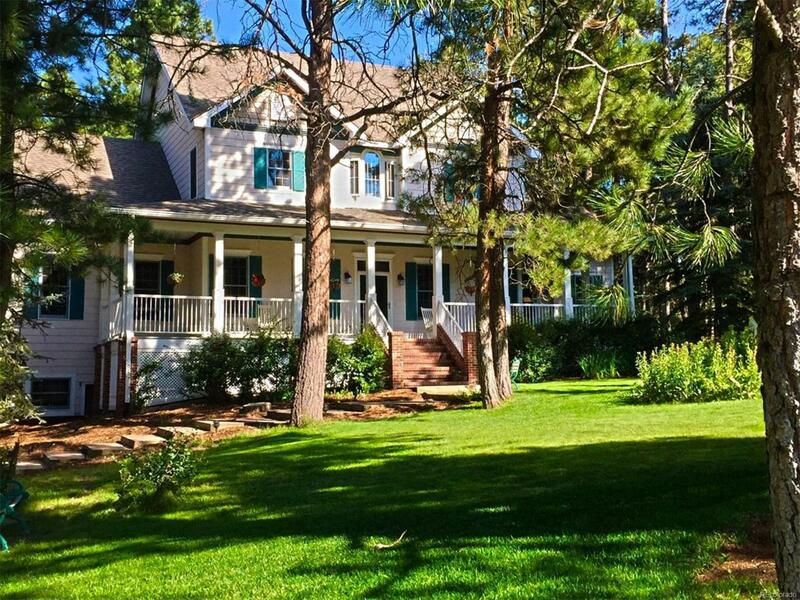 Enjoy Colorado evenings relaxing on the cozy 50 long front porch with wood ceiling, crown molding with front and kitchen entrances. Beautiful custom designs throughout including custom handmade Cherry doors, designer arched and leaded wood windows and built-in study nooks in bedrooms. Gourmet kitchen featuring stainless steel top-of-the-line appliances, double wall oven, center island with 5 burner gas range top, Cherry cabinets, new granite countertops, tile floor & eating area with walk-out to front porch. The formal dining room features chair railing & hardwood floors, perfect for large family dinners. Formal living area is off the front of home and the large great room w/ gas fireplace, custom wood mantel & tile surround, tray ceiling and double walk-outs to the two tiered deck. Main level master has sitting area, hardwood floors, private bath with steam shower, jetted tub & walk-in closet.